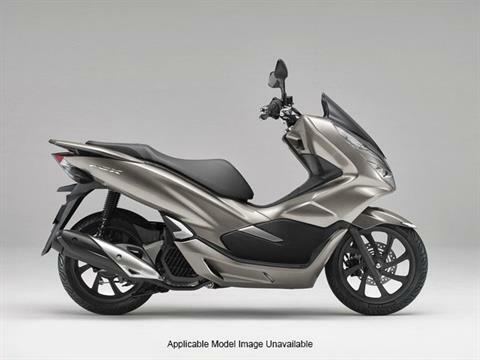 New 2019 Honda PCX150 Ride Motorsports is located in Woodinville, WA. Highlighted by a stylish design and enjoyable performance, Honda's PCX150 has long been the ideal choice for riders who want to have a little fun while getting around. Thanks to its liquid-cooled engine and smooth lines, the 2019 PCX150 turns heads wherever it goes, while also offering great range and considerable comfort through its well-tuned chassis and dual rear shocks, now featuring 3.33 inches of travel. With a light curb weight of 289 pounds, a nimble 51.8 inch wheelbase and a low 30.1 inch seat height, the PCX150 is an easygoing scooter that brings an element of enjoyment to any ride. Low-friction Honda V-Matic automatic transmission provides smooth, predictable acceleration while also bolstering fuel efficiency. Large air filter and optimized exhaust system enhance airflow, contributing to strong engine performance. Large 2.1 gallon fuel tank located under floorboard for low center of gravity and enhanced riding traits. Sidestand and centerstand offer parking versatility. New frame contributes to reduced weight and added stability, for a confidence-inspiring ride. Stylish eight-spoke wheels are lightweight and enhance overall handling. Large, lockable under-seat compartment now provides 28 liters of storage space and features a saddle hinge for easy loading or unloading of items. Storage compartment under dash for small items, with a large lid for easier access. Expansive leg area offers optimal room for a comfortable riding position. LED headlights, taillight, turn signals, and license plate light lend a distinctive look while producing brilliant illumination. X-shaped taillight assembly offers great visibility and supports overall design. Integral 12-volt adaptor is a convenient charging point for personal electronics. ALWAYS WEAR A HELMET, EYE PROTECTION AND PROTECTIVE CLOTHING. NEVER RIDE UNDER THE INFLUENCE OF DRUGS OR ALCOHOL, AND NEVER USE THE STREET AS A RACETRACK. OBEY THE LAW AND READ THE OWNER'S MANUAL THOROUGHLY. For rider training information or to locate a rider training course near you, call the Motorcycle Safety Foundation at 1-800-446-9227. 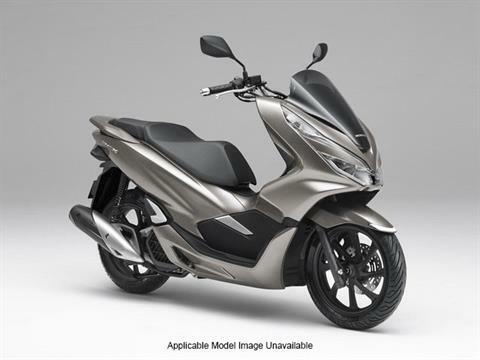 PCX is a registered trademark of the Honda Motor Co., Ltd.